Stops animals from damaging garden areas. Easy to install, reusable.&nbsp; Use as fence, plant cover or border. This Erosion Cloth comes in a roll 48 in. X 225 ft. and is a woven jute product for commercial erosion control application. 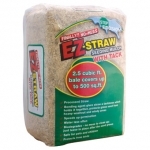 Rhino EZ Straw Grass Seed Germination Blanket 4' X 50'. 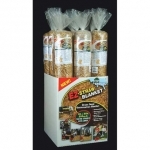 EZ Straw grass seed germination blankets are just like commercial straw blankets in a homeowner size. The 200 square foot blanket is perfect for slopes, banks, and ditches by holding grass seed in place and insuring that it does not was away. Simply unroll and stake with included stakes, seed, water, and watch your grass grow. After grass is established, blanket simply biodegrades. 9 rolls in a display carton. Ross Tree Guard protects tender bark against damage. Ideally suited as a wrap to protect the bark of young trees and shrubs. 4 wide flexible woven poly fabric. Reduces excessive water loss and drying of the bark.